A delicious copycat recipe for Chipotle’s tofu sofritas that’s loaded with flavor and a hint of spice. 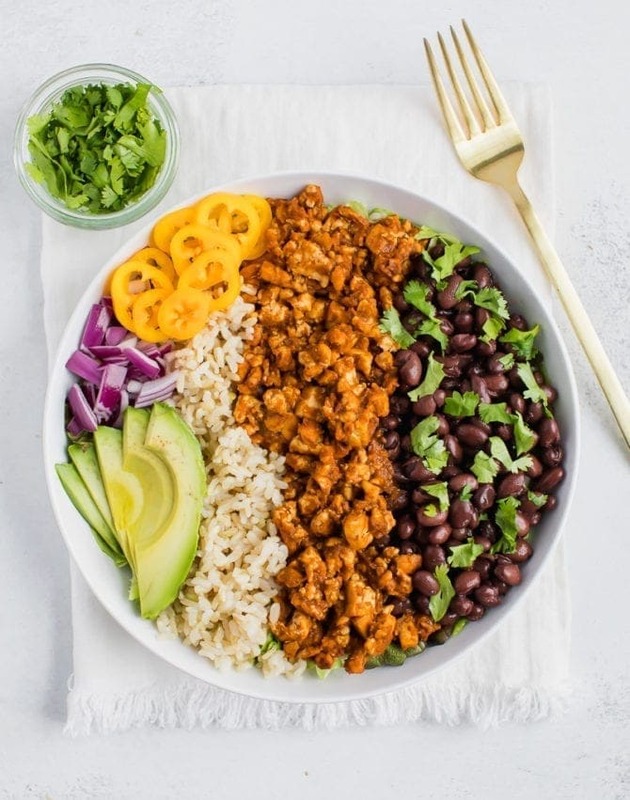 It’s the perfect vegan protein option for homemade burrito bowls! I don’t know about you, but I was so excited when Chipotle came out with their tofu sofritas a couple years ago. 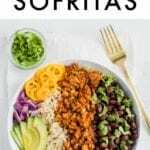 If you’re not familiar, sofritas are made of marinated and braised tofu and this addition to the menu gives vegetarians/vegans a meat-free option at this popular restaurant! Sure, you can totally just avoid meat and load up on rice, beans and veggies, but I love the added protein sofritas (aka tofu) can add to a meal. 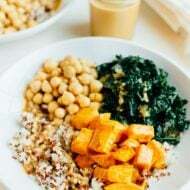 I’m not vegetarian, but I still get super excited with big chains start offering plant-based options. And since Chipotle burrito bowls are so tasty (but kind of pricey) I figured I should create a copycat recipe so we can all have Chipotle burrito bowls at home on the reg. The star ingredient in the sofritas recipe is the tofu. Look for extra firm tofu. I love the Twin Oaks brand, which is made locally, but any extra firm tofu will do. You’ll want to drain and press your tofu before cooking. Not familiar with tofu prep? No worries! Cut a slit in the tofu package and drain all of the water out. Create a tofu press by wrapping the tofu block in paper towels or a clean dish towel and set on a baking sheet or cutting board – just make sure it’s a flat surface! Stack a few heavy items on top to press the extra moisture out. I love using a cast iron skillet, canned food or cookbooks. It can take 30-90 minutes to press most of the moisture out (depending how heavy your pressing items are!). Why press your tofu? It takes out all of the excess moisture so it will crisp nicely and absorb the flavors in the dish… #science. If you eat tofu often, it might be worth investing in a tofu press. I have one and love it. While your tofu is getting pressed, you can go ahead and prep the sauce. Start by blistering the poblano pepper. Again, this may seem intimidating but I promise it’s super simple! Simply hold over the flame of a gas range or broil it in the oven. Let cool then remove the stem and seeds. Blend the roasted poblano pepper, chipotle peppers in adobo sauce, onion, garlic, tomato paste, tamari, apple cider vinegar, water, sugar and salt. 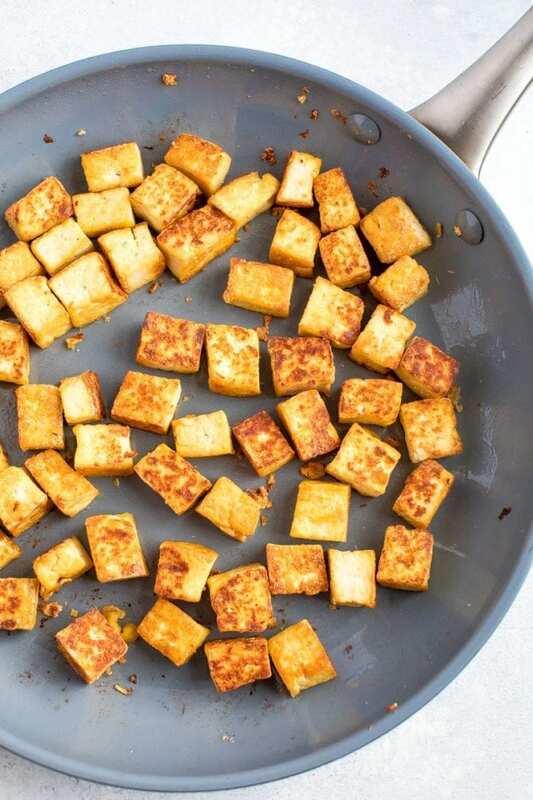 Once your tofu has been pressed, cut into cubes and add to a skillet with olive oil. Cook until the cubes are golden brown on all sides and then use your spatula to break up the cubes into crumbles. Stir in the sauce and simmer. Assemble your bowls and voila! You’ve got a copycat Chipotle tofu sofritas burrito bowl. 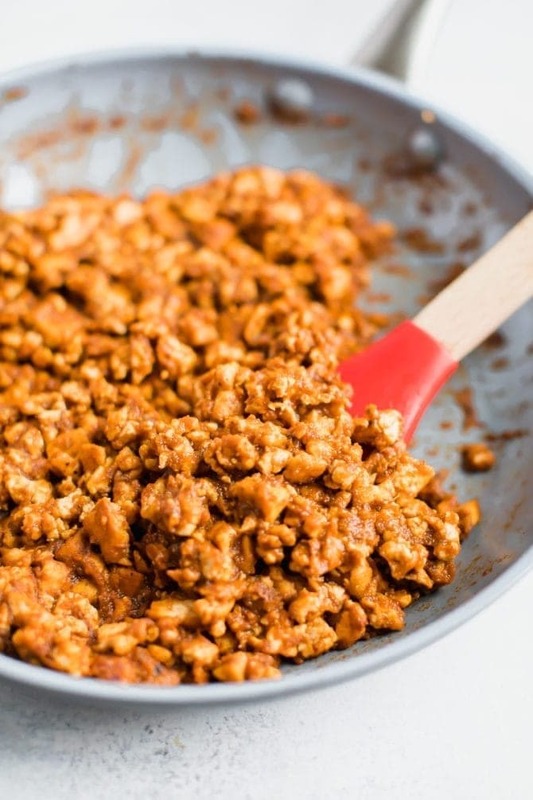 If you make this Copycat Chipotle Tofu Sofritas recipe, be sure to leave a comment and star rating below letting me know how they turn out. 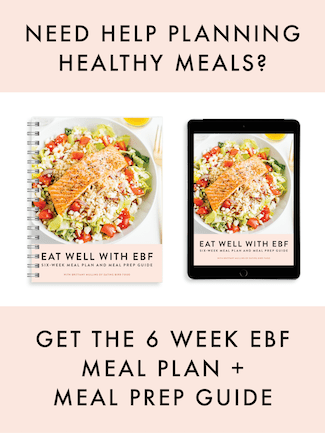 Your feedback is super helpful for the EBF team and other EBF readers! A delicious copycat recipe for Chipotle’s tofu sofritas that’s loaded with flavor and a hint of spice. 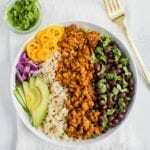 It makes a great vegan protein option for homemade burrito bowls! 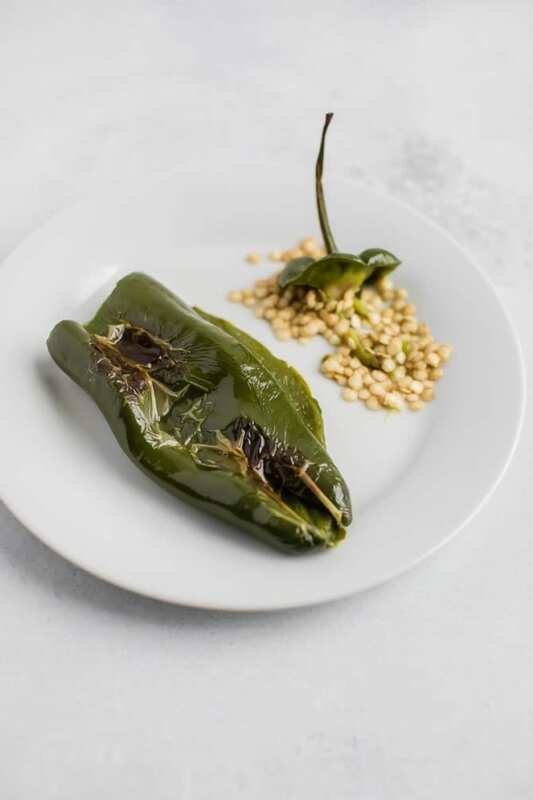 Char poblano pepper by holding it over the flame of a gas range until it’s blistered and warm throughout or broil in the oven. For the oven method, rub a little olive oil over the outside of the pepper and heat on broil for about 15-20 minutes or until the pepper is soft and blistered. Let cool before removing the stem and seeds from the pepper. See photo. You can also remove the skin if you’d like, but I didn’t. In a food processor or high powered blender add roasted poblano pepper, chipotle peppers, adobo sauce, onion, garlic, tomato paste, tamari, apple cider vinegar, water, sugar and salt. Blend until smooth. Meanwhile in a large skillet heat 1 Tablespoon of olive oil over medium-high heat. Once hot add tofu cubes and cook until all sides of the tofu are golden brown. You’ll have to keep stirring the tofu throughout for this to happen. Once golden, use your spatula to crumble the tofu into small pieces. You can leave some cubes larger for more texture. 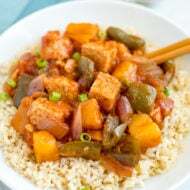 Pour sauce into the skillet with the tofu and simmer for about 10 minutes, adding an additional 1/4 cup of water if needed for desired consistency. Taste and adjust seasonings if needed. 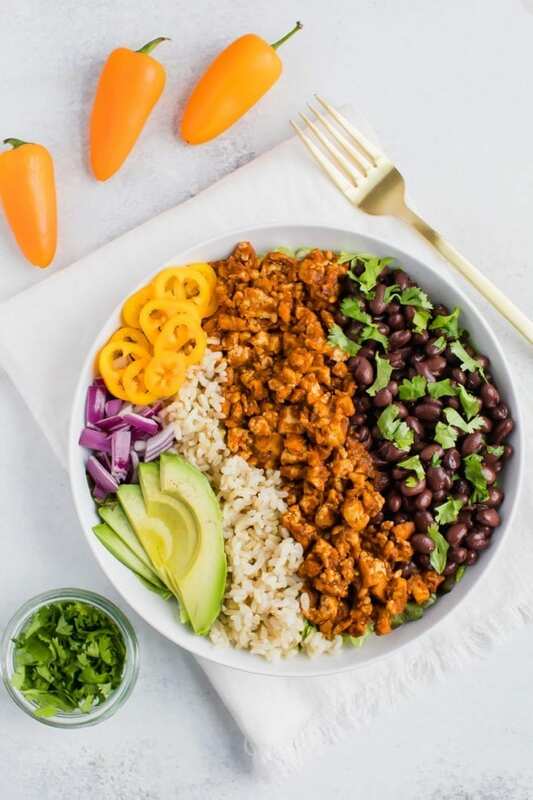 To make bowls, add a base of romaine lettuce to each bowl and top with a portion of the tofu sofritas, 1/2 cup brown rice, red onion, cilantro and avocado. This is really interesting and looks so yummy and beautiful, how can I do adobo sauce? 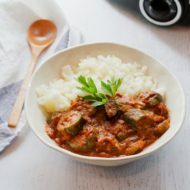 In portugal I can’t get this kind of sauce, would you recommend any site to buy or is it easy to make? Um, this looks AMAZING. Nice work, friend!